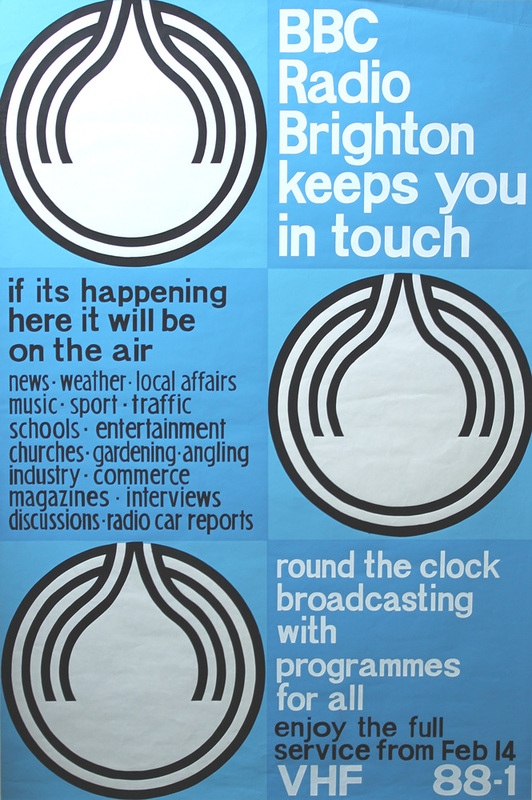 The fifth of the BBC local radio stations, and the first outside of the north and Midlands, was BBC Radio Brighton (now BBC Sussex). 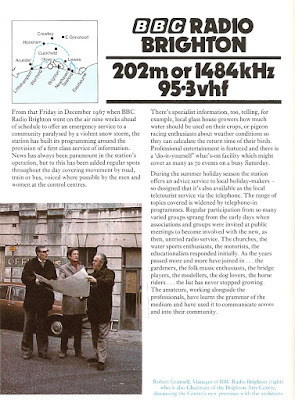 Its planned launch date was 14 February 1968 but the station had already made an impromptu appearance in December 1967 (from some old BBC regional studios at the Royal Pavilion) when snow storms brought Sussex grinding to a halt, thus immediately demonstrating the value of a local service in bad weather and the importance of a 'snow line'. Pulling together the new station was Bob Gunnell. 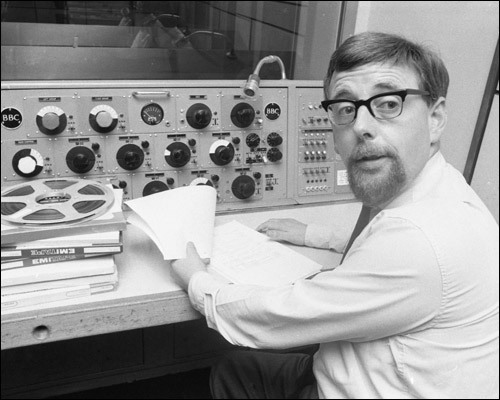 Bob had joined the BBC engineering staff in the 1940s and by the late 50s was a producer and then later presenter working on such programmes as The Younger Generation, Listen Awhile and Home This Afternoon. Brighton's studios were located at the old Blenheim Hotel on the corner of Marlborough Place (pictured above). Helping to kit it out was station engineer Ted Castle who'd previously worked for the OB unit in London and second engineer George Orchard. Bob's deputy, was programme organiser David Waine. David had been at TV reporter for the BBC in Southampton and would go on to manage BBC Radio Bristol, then as regional Television manger in Plymouth and finally as head of Network Production Centre and then Head of Broadcasting BBC Midlands at Pebble Mill. Bob Gunnell famously made two quirky managerial decisions when the station launched. First he was very much against playing any pop announcing that "we aim to be a sweet station rather than a hard pop music station." More controversially was the insistence on time checks being given in 24-hour clock much to the confusion of presenters, contributors and listeners alike, though this directive was soon dropped. Bob remained in charge of the station for 15 years and following his retirement he served on the local council, was a magistrate and helped create the Brighton and Hove Arts Council. He died in 2014 aged 87. Other staff appointed were John Henty (pictured above), Keith Slade, Mike Matthews, Chris Jones, Hilda Bamber and Carole Stone. Mike had gained his broadcasting experience in New Zealand at NZBC and would later be part of the launch team at Radio 210. Hilda Bamber had started broadcasting with the BFBS and had for some commercial station experience in New Zealand. She would later join Radio 4 as a continuity announcer before becoming an IRN newsreader. Carole Stone had started at the BBC in 1963 as a news copy-taker. She remained with Radio Brighton until 1970 when she joined Radio 4 as a talks producer and then to BBC Bristol where she produced Down Your Way and Any Questions? 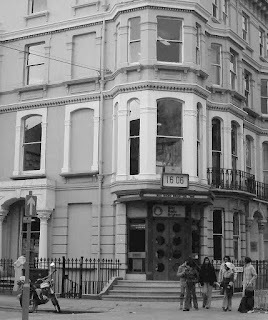 The station officially went on air at 6 p.m. on Wednesday 14 February 1968 with the Mayor of Brighton, Councillor Ronald Bates, cutting a piece of recording tape across the station entrance. A star-studded cast told the story of the town; Laurence Olivier, Flora Robson, John Clements and Dora Bryan all lived locally. Other guests, introduced by Mike Matthews included Elsie and Doris Waters, perhaps suggesting that the station wasn't too interested in pulling in a young audience. The opening programme also included an OB with John Henty positioned on Sussex Heights, then the tallest building in the area, where he was to describe the view. Unfortunately, a heavy sea mist came down and he had to explain his predicament and rely on his memory. 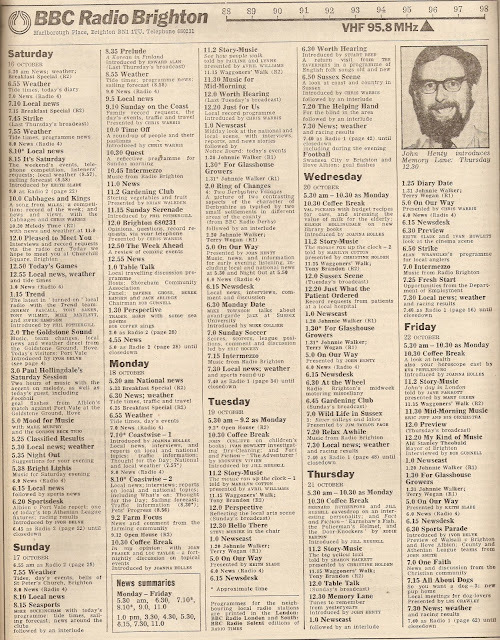 This is how the Radio Brighton's programme schedule looked for the week commencing 16 October 1971. One of the best known voices in the early days of BBC Radio Brighton was that of John Henty. Born and educated in Surrey John started his working life as a clerk for Shell before joining the Croydon Advertiser as a junior reporter. He lists his first broadcast as reading the news on KIST in Santa Barbara in March 1960, although I've no idea what he was doing over in California at that time. He spent five years with BEA as an airline public relations officer and was also volunteering for a local hospital radio station where he eventually started to provide football commentary. It was that commentating experience that swung him the job at Radio Brighton, nominally in charge of their sports programmes. He presented local radio's first travel show, Travel Bag ('produced in collaboration with local travel agents' per the programme billing) and in the mid-70s had the distinction of broadcasting on the breakfast show, Coastwise, a feature called My Early Bird Club that was introduced by a worm called Wurley. John went on to work at Blue Danube Radio and in the late 80s made programmes for hospital radio sponsored by British Telecom under the title Nice 'n' Easy. He also a leading authority on the British illustrator Mabel Lucie Atwell and founded and ran a museum dedicated to her. Keith Slade (above) was brought into the station having had no broadcasting experience and in time became a regular arts programme producer. Born in Brighton he'd studied drama and worked for The Argus for a short time before going into teaching at the Florence Moore Theatre School in Hove. His knowledge of the local arts scene gave him the opportunity to contribute to many Radio Brighton programmes until his retirement in 1988. He died in 2002 aged 74. Ivan Howlett was born in Suffolk but moved to the Brighton area to take up teaching. He joined Radio Brighton mainly contributing to arts programmes but later became the station's news editor. Ivan moved back to his home county in 1990 as Managing Editor on the newly launched BBC Radio Suffolk. Leaving the station in 1998 he returned to programme making, principally for Radio 4 with series such as Making History, Rare Books, Rare People and a number of editions of The Archive Hour. He died in 2008 aged 66. 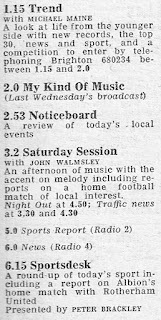 Phil Fothergill, here listed as introducing Trend on Saturday afternoon, had started his broadcasting career as a technical operator. He moved over to commercial radio when that started in 1974 at Swansea Sound. Later he worked at KNET in Texas, Radio Orwell, Radio 210, Blue Danube Radio and was programme controller at Chiltern Radio when that launched in 1981. By the end of the eighties Phil moved over to television as a continuity announcer and then promotions director at Anglia TV. He was a production manager at QVC and set up his own production company TVUK. More recent radio work has included MKFM and Radio Vienna International. Note that Paul Hollingdale pops up on Saturday afternoons. Paul had returned to his home town after been given the boot by his Radio 2 bosses as one of the hosts of Breakfast Special. He freelanced for a while and that included a spell at Radio Brighton. By 1976 he was up in Reading as the launch DJ on Radio 210. You'll also spot as one of the contributors on Trend the name of Jeremy Pascall. 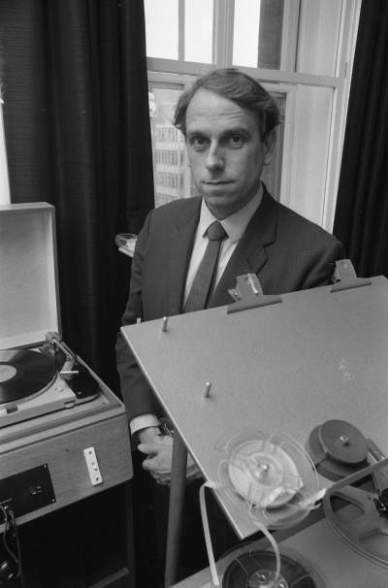 Jeremy was an NME reporter and first appeared on BBC Radio Brighton in 1969 as part of Pop Inside team alongside Anne Nightingale and Tony Baker to discuss the Brighton music scene. He'd go on to join Capital Radio where he is perhaps best known for The Uncyclopedia of Rock and being part of the Brunch team. For the BBC he and Phil Swern were the question setters on a number of TV and radio quizzes. He died in 2001. One of Radio Brighton's best-known alumni is Desmond Lynam. Appearing on the station a few weeks after it had gone on air Des was working in banking and then insurance. He'd dabbled in writing the odd sports article for local papers and football magazines. In 1968 the station had advertised that it was looking for volunteers and Des was invited in by David Waine and given an audition. He soon found himself reading the Saturday afternoon football results and other sports news. "In no time at all, under the experienced eye of an amiable chap called John Henty, I was presenting the Saturday night sports desk. Soon I was writing a weekly review of the local press, which involved arriving at the studio at 6.30 in the morning; reading through the three local weekly papers and writing, by hand, a three-minute piece to be voiced live just before the 8 a.m. news bulletins". Des remembers an early attempt at radio comedy: "Together with Ivan Howlett, John Henty, Peter Vincent (who went on to be a top comedy writer for The Two Ronnies and others), and a girl singer called Amaryllis, I began putting together and performing in a Sunday half-hour show called How Lunchtime It Is - there was a TV series called How Late It Is that had prompted the idea for the title". Apparently Des's contribution included passable imitations of Harold Wilson and Ted Heath. In due course he joined the staff of the station but by late 1969 had moved to network radio in London as a Sports News Assistant. The proximity of Brighton to the capital meant that some other broadcasters made to trip up the Brighton line to Broadcasting House. 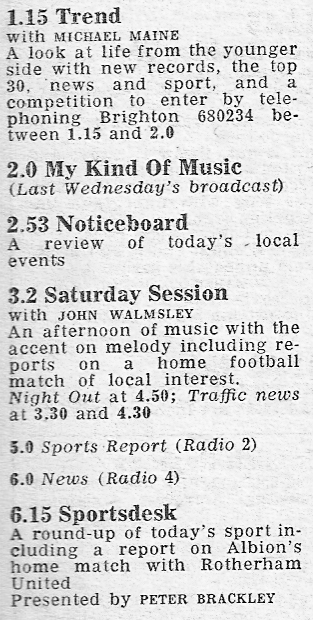 In this extract from the Radio Times schedule for the week commencing 4 September 1976, picked up on my one and only visit to Brighton, lists John Walmsley, who'd actually been with the station since 1968 and later was on Radio 1's Newsbeat and Peter Brackley, later on Sport on 2. By this time Piers Bishop had also joined the station and he would go on to open BBC Radio Sussex. Other well-known names that passed through the doors at Marlborough Place in the early days were Kate Adie, playwright and screenwriter Ken Blakeson, the Rev Frank Topping, a regular contributor to Radio 2's Pause for Thought and Barbara Myers later on Radio 4 and a presenter of Outlook on the BBC World Service. 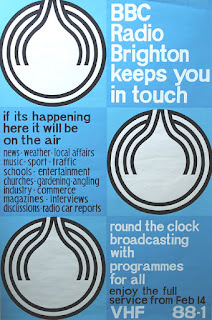 The name BBC Radio Brighton was dropped in October 1983 as the station became BBC Radio Sussex, then BBC Southern Counties Radio in 1994 and finally BBC Sussex in 2009. 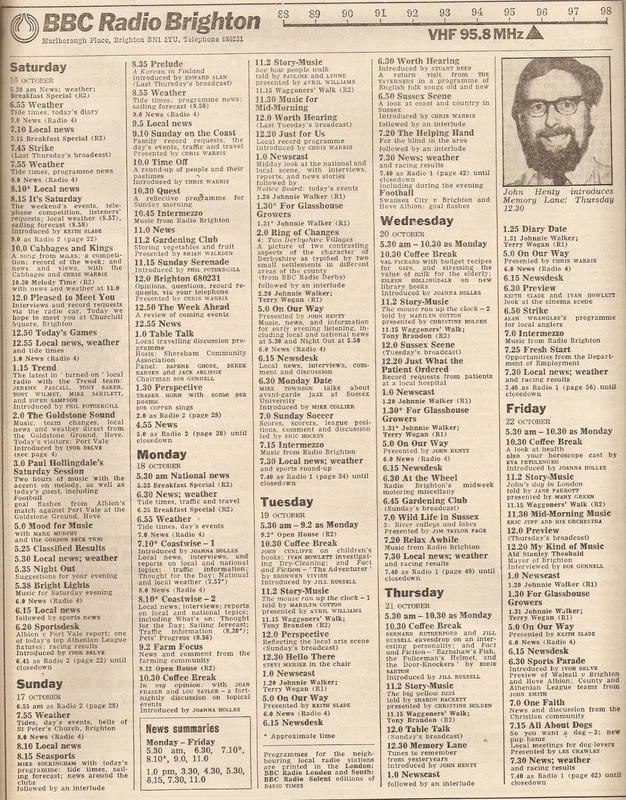 To mark 30 years of the name change to BBC Radio Sussex this programme, presented by Ian Collington, traced the history of local radio in the area to the start of BBC Radio Brighton so there are plenty of clips from that era. BBC Sussex at 30 was broadcast on 22 October 2013. A special 3-hour programme 50 Years of the BBC in Sussex airs this Wednesday evening at 7.00 pm on BBC Sussex.